Well-regarded in the industry for high, reliable gene expression, SBI’s lentiviral vectors also efficiently deliver RNAi. Generate cell lines with stable, heritable gene silencing to develop a thorough understand of the target gene’s function. Our HIV-based pSIH1-H1-copGFP shRNA Cloning and Expression Lentivector drives expression of your shRNA template from the H1 promoter, and includes a copGFP marker driven by the strong CMV promoter for sorting. After processing in the cell, your shRNA will be converted into siRNA. Figure 1. 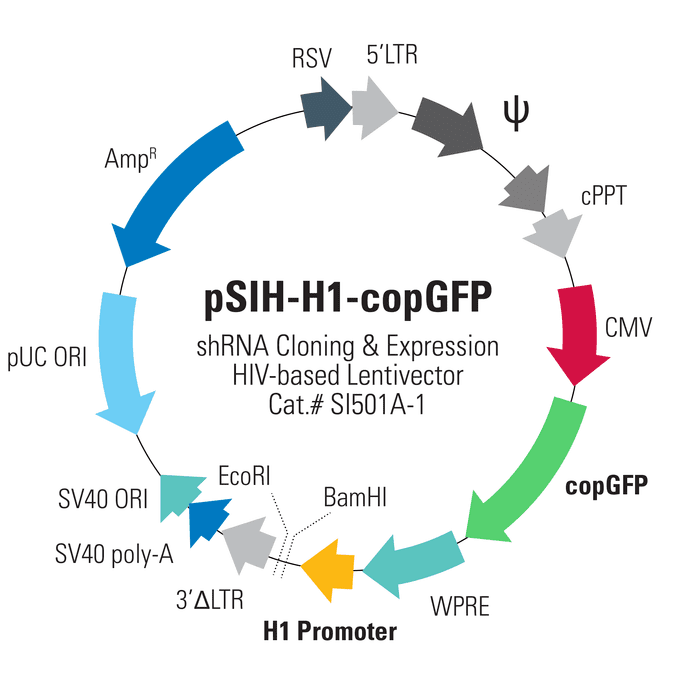 Generating siRNA from the pSIH1-H1-copGFP Cloning and Expression Lentivector.